Is deacair a thuiscint agus tú i do sheasamh ag breathnú amach ar Pháirc an Mháimín inniu, nach raibh anseo tráth den tsaoil ach portach nó “Currach” mar a thabharfadh muintir an cheantair air. Ba mhór i gceist “Currach an Mháimín” ag leads óga na háite mar gur ann a thagadh siad ag imirt peile agus cluichí eile. Cén chaoi ar tharla sé gur san áit seo a tógadh an pháirc peile? Is cosúil gur áit é seo a mbíodh peil á imirt ann siar sna 20adaí agus sna 30adaí. Ba le Micheal Johnny Mac Donnchadha as an Máimín an píosa talúna seo agus thug sé cead do leads óga na háite peil agus cluichí eile a imirt ann, gan cur isteach ná amach orthu. Tharla sé go bhfuair Micheal Johnny an seans aistriú go Contae na Mí chuig áit agus talamh a bhí níos fearr. Tar éis dó roinnt smaoineamh a dhéanamh air, shocraigh sé aistriú síos go lár tíre agus an áit a bhí aige sa Máimín a thabhairt suas (siad muintir Sheáinín Pheait Bhearthla a tháinig san áit.) Nuair a bhí na socruithe á ndéanamh i dtaobh an aistriúcháin, d’ordaigh Michael Johnny do John Glynn, an fear a bhí i gceannas na scéime, nach raibh sé sásta an píosa talúna ar a mbíodh na leads ag imirt air a thabhairt suas, mar go raibh sé á fhágáil sin i gcomhair leads óga na háite agus ag an nglúin a thiocfadh ina ndiaidh ionas go mbeadh áit acu le “Football” a imirt ann. 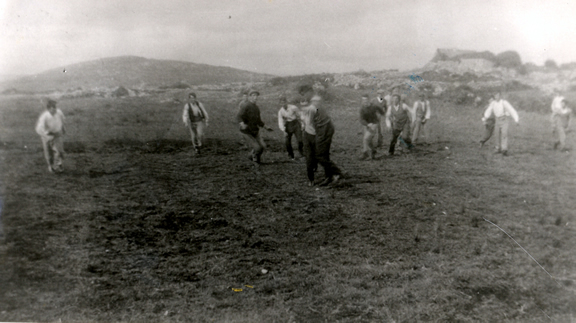 Déanadh mar a d’ordaigh Michael Johnny agus fágadh “Currach an Mháimín” i gcomhair “Football”. Is iomaí cic buailte ar liathróid ó shin i leith agus is iomaí peileadóir a chuir barr feabhais ar a chuid scileanna peile san áit seo. Thóg Cumann Peile Naomh Anna seilbh ar an áit tamall tar éis a mbunaithe sa bhliain 1964 agus sna 70adaí bheartaigh an Cumann, faoi stiúir an tAthair Micheál Ó Flannbhara, Michael Mór Ó Conghaile (nach maireann), Nioclás Ó Conchubhair agus daoine eile, an áit a fhorbairt agus páirc pheile a thógáil ann. Rinne siad féin agus muintir na háite éacht agus páirc a dhéanamh ann. Cuireadh athchóiriú iomlán ar an bPáirc sna 80adaí faoi stiúir Mháirtín Bhreathnach, Pádraig Ó Conghaile, Paddy Pheada Ó Conghaile (nach maireann) agus baill eile den chumann agus arís, agus Comórtas Peile na Gaeltachta á reáchtáil ag Cumann Naomh Anna i 2002, shocraigh an coiste tuilleadh forbairt a dhéanamh faoi stiúir Chóil Uí Cheallaigh, Cóilín Ó Conghaile (fochoiste na páirce) le cabhair mhór ó FÁS, Comhairle Cheantar na nOileán agus An Roinn Ealaíon, Oidhreachta, Gaeltachta agus Oileán. Níl an fhorbairt le críochnú anois ach oiread, mar go bhfuil tuilleadh oibre beartaithe ag an gCumann agus muid ag tabhairt faoi Ionad Spóirt agus Seastán a thógáil. Is cóir tacaíocht mhuintir na háite agus dhaoine taobh amuigh den cheantar a lua agus an chabhair a thugann siad don chumann i gcónaí trí Lotto an Chumainn a cheannach agus chuile chabhair eile dá dteastaíonn a thabhairt. Dá mairfeadh Michael Johnny agus “Currach an Mháimín” a fheiceáil inniu, nach é a bheadh bródúil sásta, díreach mar a bheadh na daoine ar fad a raibh a gcroí sa gCumann Peile agus sa bpeil féin, ach atá anois i láthair Dé. Ní dhéanfar dearmad orthu go brách na breithe. Inniu agus tú ag breathnú amach nó ag imirt ar Pháirc an Mháimín, cuimhne orthu siúd ar fad a raibh lámh acu i gcur chun cinn an Chumainn Peile seo agus i bhforbairt na Páirce seo. Ach cuimhne go mór mór ar an bhfear a d’fhág an píosa talúna seo ag leads óga na háite an chéad lá riamh. Buíochas leat a Mhichéal Johnny agus solas na bhflaitheas duit.